For all those who stuck around with Google’s free blog hosting service Blogger, Google has just rolled out the new Template Designer. Finally, the folks at Blogger.com realized that the old selection of templates are too outdated and decided to introduced some new templates that you can use on your blogs as well as a new set of tools for customizing your blogs including designing your own Blogger template. This is also good news for those who wants to start their own blogs just now but don’t want to use WordPress.com. Google’s Blogger Template Designer currently offers 15 new professional templates, custom blog layouts that you can apply in each of the new templates, professional background images coming from iStockphoto plus several color, fonts and other customization features that you can use. The Blogger Template Designer is Â currently hosted in Blogger in Draft where you are free to try it out on your blog. You can see the Template Designer if you click on the Layout link. Once you’ve come up with the best template and design for your blog you can opt to apply it on your blog. It would be interesting to note why it took Google this long to come up with such features. I almost thought that Google is about to shut down Blogger since it has not been given too much attention the past few months. But then again, given the millions of blogs hosted on Blogger.com, Google will definitely put this service down. If you are currently maintaining a Blogger blog, check out the new Template Designer and share with us your experience. Latest data from Forrester is showing that a new category of Internet users are now comprising 1/3 of the total Internet population. Â This group called “conversationalist” are Internet users who post status updates on social networking sites such as Twitter and Facebook, at least once a week.Â In addition, these conversationalists are mostly female, with 70% of them age 30 years old and above. Creators – are Internet users who create content either through their own blogs or websites, upload video and audio content as well as write articles and post them online. This group represents 24% of the total Internet population. Critics – are Internet users who Â post product reviews, comment on blogs, participate in online community forums, and contribute to wikis. They represent 37% of the Internet users. Collectors – are those who tag photos, participate in online voting and use RSS feeds. This group represent 20% of Internet users. Joiners – those maintain profiles in social networking sites and visit these sites often but don’t really join in the interaction. They represent 59% of the Internet users. Spectators – comprising 70% of Internet users, this group read blogs, listent o podcasts and consumer online information but don’t really contribute. Conversationalists – this group is comprised of those who post updates on social networking sites such as Facebook and Twitter regularly, that is once a week. 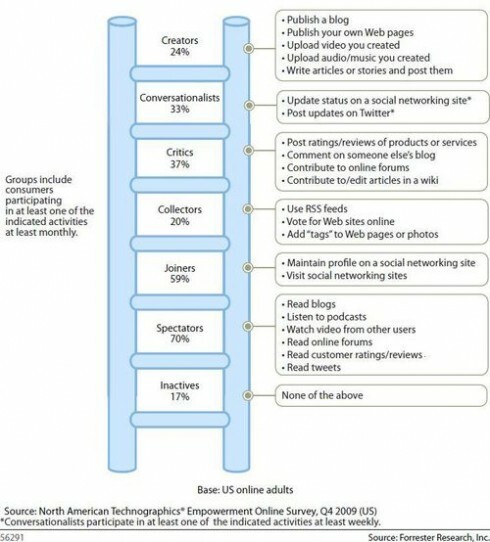 The data was based on Forrester’s social technographics whereby social technology behavior were analyzed to construct those social profiles. An interesting fact about this data that is worth noting is the fact that although more people are joing social networks, the number of those people who create content remains the same. Of course this is understandable since it is easier to maintain social networking profiles as well as participate in the communication compared to maintaing blogs, creating websites, uploading videos and other ways of creating online content. So, which group of Internet users are you? Here you go, the endless updates to everybody’s favorite blogging software, WordPress 9 is now available for download. Codenamed “Carmen” after the legendary jazz vocalist Carmen McRae, WordPress 9 boasts of several nice features with the built-in image editor as probably the one feature you would surely like. 1. Global undo/”trash” feature – lets you restore posts or comments which you might have accidentally delete. 2. Built-in image editor – crop, edit, rotate, flip and scale your image attachments before publishing your post. 3. Batch plugin update and compatibility checking – lets you update 10 plugins at once, also check whether plugins are compatible with new releases of WordPress. 4. Easier video embeds – this feature is going to make all our lives easier. This will let you paste a URL on its own line and WordPress will turn it into a video embed code. Supports YouTube, DailyMotion, Blip.tv, Flickr, Hulu, Viddler, Qik, Revisions3, Scribd, Google Video, Photobucket, PollDaddy and WordPress.tv. 1. rel=canonical support for betther SEO. 2. automatic database optimization support, which you can enable in your wp-config.php file by adding define(‘WP_ALLOW_REPAIR’, true);. 4. a new comment meta table that allows arbitrary key/value pairs to be attached to comments, just like posts, so you can now expand greatly what you can do in the comment framework. 5. Custom post types have been upgraded with better API support so you can juggle more types than just post, page, and attachment. Alright, time to do some WordPress upgrading folks. Good luck! 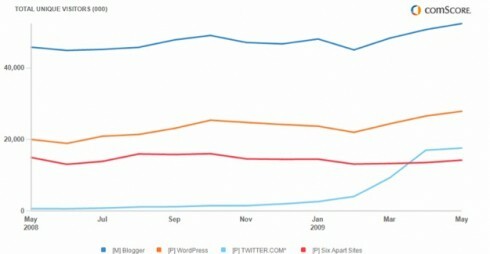 While the team at Techcrunch a comparison with other blog platforms and Twitter published (see graphic below), the real question to ask here is in how far Facebook a blogging platform has become for many people. Writing a weblog today isnâ€™t the bright idea it was four years ago. The blogosphere, once a freshwater oasis of folksy self-expression and clever thought, has been flooded by a tsunami of paid bilge. Cut-rate journalists and underground marketing campaigns now drown out the authentic voices of amateur wordsmiths. Itâ€™s almost impossible to get noticed, except by hecklers. And why bother? The time it takes to craft sharp, witty blog prose is better spent expressing yourself on Flickr, Facebook, or Twitter. There is no doubt that Google made a great decision purchasing Blogger, especially considered the amount of Adsense ads the Blogger platform runs, but the biggest question is if blogs will continue to grow perpetuously or if there will be a new shift towards bigger CMS platforms now new media companies such as B5Media Inc. are integrating forums as well on their main blogs. What is a blog? The line is blurred and we have seen many sites evolve from ‘blog’ to multi-authored magazines. I, for one, am looking forward to read the next State of the Blogosphere at Technorati. You can read the 2008 State of the Blogosphere here. A pending application to the New York Supreme Court seeks to force Google to divulge the identity of an anonymous blogger because of a few comments made on the Internet on one single day. A hearing on the motion to reveal the anonymous blogger’s identity is scheduled for tomorrow. The petitioner, fashion model Liskula Cohen, alleges that references to her as a “skank” and “ho” on the website “Skanks in NYC” constitutes actionable libel under New York law and on that ground seeks to unmask the anonymous blogger. “Ideas are exchanged freely on the Internet in large part because participants can speak using assumed names or no name at all,” Guzov added. How about you? What is your take on this arguments?